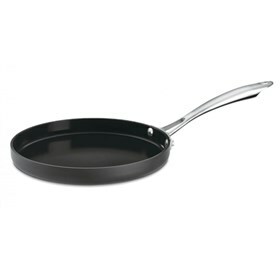 The Cuisinart GG23-24 GreenGourmet 10" round griddle/crepe pan is designed using manufacturing techniques that reduce harmful carbon emissions by consuming less energy. Featuring a ceramic-based nonstick coating made without the use of petroleum, the griddle/crepe pan is made of 100% recycled materials and is printed with soy ink. The GreenGourmet 10" round griddle/crepe pan with hard anodized pan construction provides superior heat conductivity, requiring less energy to achieve desired cooking temperature. It has a riveted stainless steel handle that stays cool on the stovetop and is constructed of 70% recycled stainless steel. The 10 Round Griddle/Crepe Pan Greengourmet Hard Anodized has many exciting features for users of all types. You can extend the lifetime of your 10 Round Griddle/Crepe Pan Greengourmet Hard Anodized with the purchase of a FactoryOutletStore Factory Protection Plan. See the 10 Round Griddle/Crepe Pan Greengourmet Hard Anodized product video and gallery images above for more details. The 10 Round Griddle/Crepe Pan Greengourmet Hard Anodized is sold as a Brand New Unopened Item.